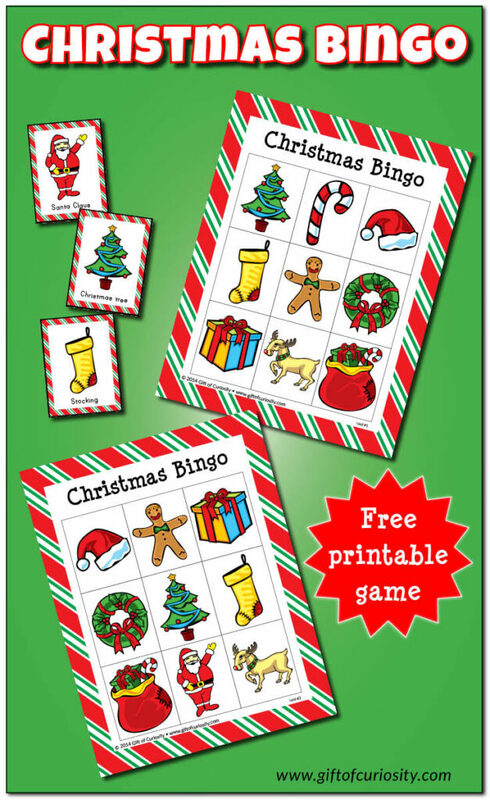 I’m really excited to share my new Christmas Bingo game. 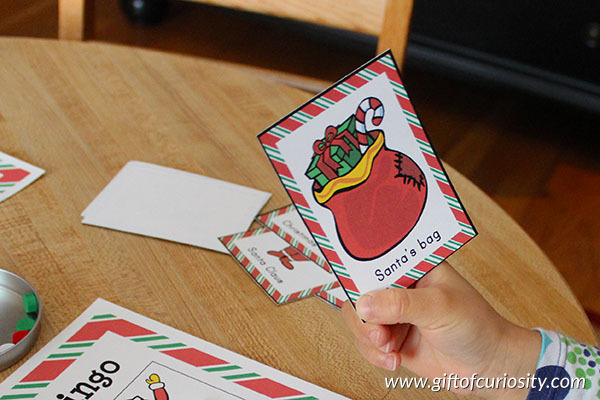 I think the cards on this free Christmas printable came out beautifully. Plus, I created 10 different playing cards, so this game would work for a large family or any other small group. 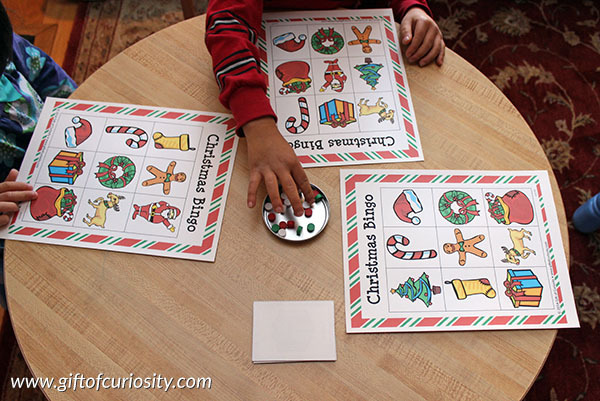 Note: For more Christmas activities and Christmas printables your kids will love, see my Christmas Activities for Kids page. 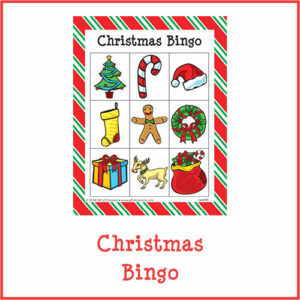 When I played Christmas Bingo with my kids, we started by each selecting a playing card. 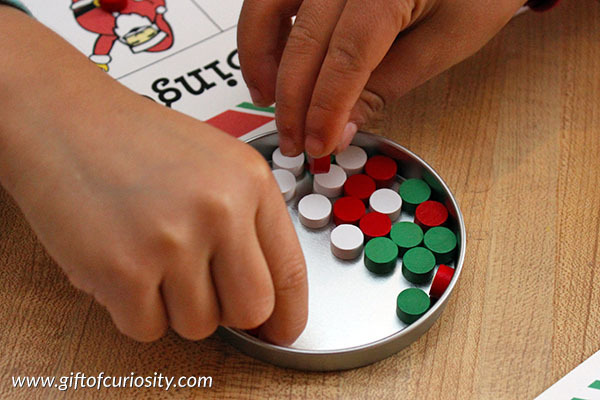 We sat around our small table and I placed red, green, and white place markers in the middle. We took turns drawing a calling card and sharing the picture with each other. Then we each grabbed a place marker. And we marked the correct image on our Christmas Bingo cards. Most of the time we played, we all achieved “blackout” Bingo at the same time. (Blackout Bingo is when you fill in your entire card.) However, because not all images are on all the playing cards, it is possible for one person to achieve “blackout” before the others. This happened the third time we played. QBoy filled in his entire card before XGirl and myself. XGirl was kind of bummed. But we just agreed to flip over the last calling card so that she and I could “win” too. Want a copy of my Christmas Bingo? Love this Bingo game! It will be a great activity for my ECSE-ELL classroom this week. Nice vocabulary building and high interest for the kiddos! Thank you for the Christmas BINGO!!! When I play BINGO games with my students I use seasonal erasers as markers. I buy several packets of them at a dollar store. The kids think it’s fun to use the erasers. What a great idea to use seasonal erasers. I agree that mixing things up a bit adds a whole new dimension and makes an old activity fresh again in the eyes of the kids. 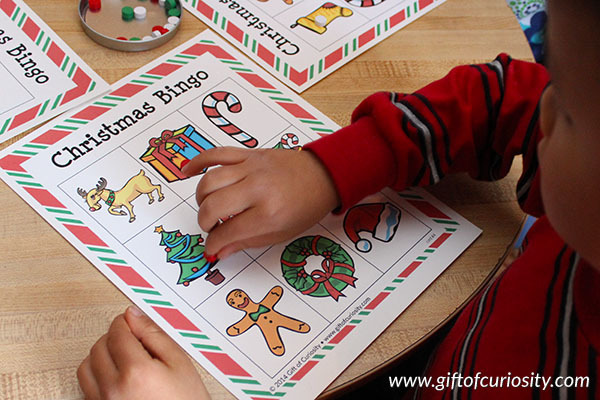 My son loves Bingo and they used to play it all the time in preschool but I think that he might be missing it now that he is in Kindergarten so it was on the of the things that he asked for Christmas. I am totally printing this out and using it until then. We will have lots of fun when grandma and grandpa are here playing this one!! How sweet that he is missing Bingo. 🙂 I sure hope he enjoys playing! Thank you! Playing this today, great addition to my Christmas planning. Simple enough for my 2 year old to play. Merry Christmas! Aww, this brought a smile to my face. So glad you guys are enjoying it!